Head office departments provide integral support to our many teams across the business. Across varying locations, we have many specialisms including IT, HR, Procurement, Finance, Audit, Innovations and Compliance. Despite the locations above, we have staff in many field-based Head Office roles too. My day-to-day role can vary from creating digital content for our website and social media channels to customer facing events. Whilst a lot of people may think that marketing is all about visuals and creativity, I spend a lot of time looking at analysis in order to improve for the future. Due to the fast natured environment we’re in, my days can vary a lot. The main aim of the game never changes though, to drive enquiries through our business! This is for the sales teams, but also service and parts. I have found that the culture at JMG is fun and relaxed with an undercurrent of necessary expectation. As an accounts team we support our allocated dealerships. In my Regional Accounting Centre (RAC) we look after Volkswagen, Skoda, BMW Mini and Honda’s Purchase Ledgers. We look after dealerships paying for goods and services, working closely with the cashiering team who make payments. My daily routine is inputting invoices, reconciliations and allocating cash, with monthly BACS runs, parts and warranty reconciliations. I received a form of promotion to take on a bigger site in BMW recently, which offers me opportunity to develop myself. We can offer people more than just a job, but a chance to build a career here, with amazing support to do training and change roles internally to gain further experiences. Jardine believe in their staff and want us to succeed! I’m very fortunate to deal with beautiful cars each and every day, creating content for social media and developing customer facing communications to ensure we offer the best customer service across all touchpoints. Event management is also a big part of my role within the high luxury sector, building events for launches of new cars and offers. My career at JMG to date has been full of personal achievements, and I am very proud of my personal development. In the 2 years I’ve been with the group, I have been promoted from Commercial Operations Executive to Luxury Brand Exec, and most recently to Luxury Brand Manager. 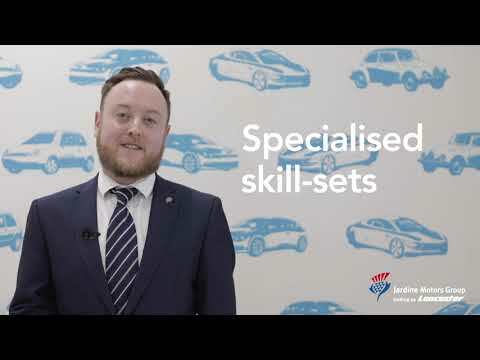 It’s not just a job working at Jardine Motors, it’s a chance to grow and develop. Our marketing department covers day-today marketing activities for brand divisions and their sites alongside managing marketing strategy and budgets. This department also includes our communications team (managing internal and external comms), our customer database experts (CRM), our aftersales contact centres and also our creatives who bring divisional and group concepts to life. Our team of IT masterminds, spanning from infrastructure & systems to 1st and 2nd line support specialists. Alongside those based in our Sunderland IT office, we also have field support specialists, offering hands-on ad hoc support to our dealerships too. Our group procurement team are experts in business purchasing for all 70+ of our business locations, ensuring consistency across our group contracts. Our legal department provide general counsel, advice and contractual expertise to departmental heads and Directors, protecting our business from risk. Our finance team is split into multiple functions across the group. Our head office in Colchester is home to group accounting, including tax, financial accounting, cost accounting and treasury. Our Divisional Accounting Centres are home to transactional processing and we also have site-based accountants. Our group customer service department is based in Sunderland looking after escalated customer queries and complaints. Our aim is to resolve any issues at site-level where possible, utilising our experienced General Managers, or at some sites, dedicated customer service colleagues, with this dedicated team for those times our customers may require additional off-site support.